Kowen Forest challenges the best enduro bikes and their riders. Photos: Supplied. About 1000 off-road motorcycle riders, the biggest field yet for the Kowen Forest Ride, will let rip in the logging landscape this weekend. Churning dust, crossing creeks and jumping logs, rocks and boulders, the riders grit and bikes grunt will conquer the elements, east of Canberra. Blasting along three loop tracks, swerving through towering pine trees, the riders’ strength and negotiating skills will be paramount. The number of riders and campers has throttled ahead for seven years, following persistent negotiations from founder Peter Daley, when he was Dual Sport Motorcycle Association ACT branch president. Entrants and their supporters come from all corners of Australia and Canberra. They will have an awesome weekend of dirt-burning fun, with registrations beginning on Friday (5 April). 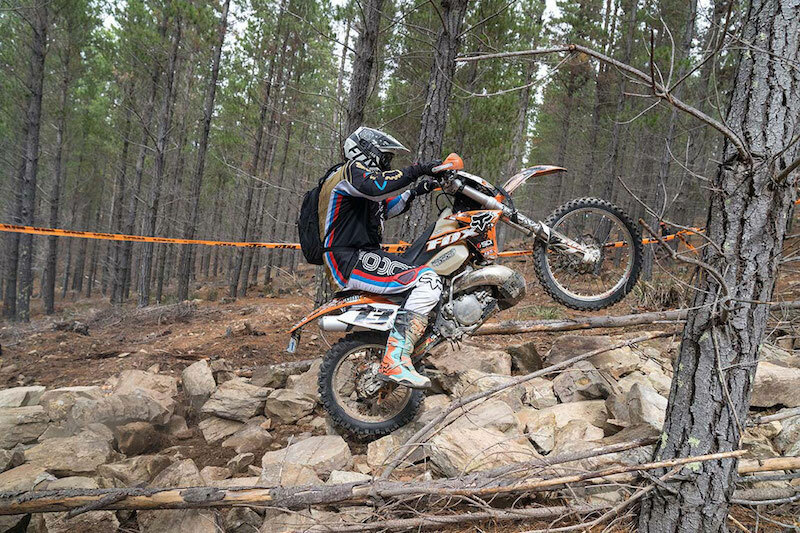 Riding on Saturday through to Sunday, entrants choose three levels of difficulty on 200 kilometres of narrow tracks. Events also include three motocross sections and jumps. Kane Piper from Canberra Motorcycle Centre and his team will staff a workshop and spare parts shop at Kowen Forest, change tyres and keep the bikes at peak performance ‘for the ride of their life’ as their motto goes. 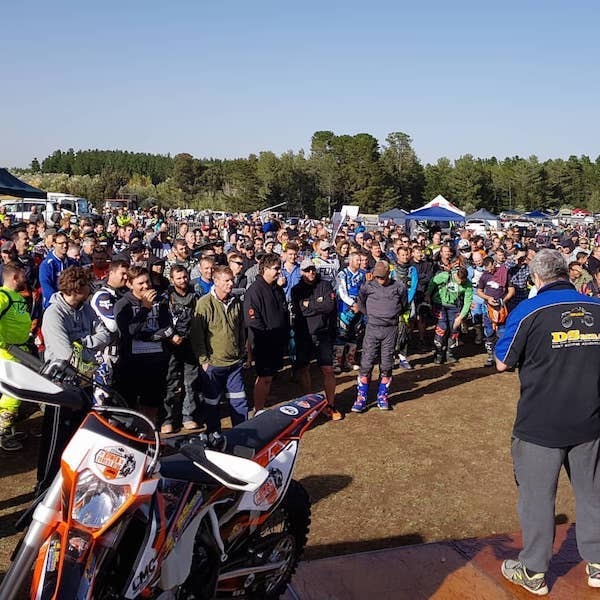 The event’s exclusive sponsor will come with a fleet of demonstrator bikes, and will construct bikes from supplier KTM that will be offered as prizes. “Lighter, enduro-style bikes are the best contenders,” Kane Piper says. “Kowen Forest is a low-paced, technical trail, the EXC bikes stand out. A lot of the guys and girls who go out there are very capable riders, over the long period the slow technical stuff becomes heavy, and hard on the body. It’s easy to go fast on an open fire road but it takes real grit after a couple of hours going through the same fire trail, getting over rocks or boulders, or up steep climbs. That’s where they are really tested,” he says. Bikes from 150cc to 500cc and mostly 300cc will tackle the challenge. Kowen Forest Ride is not a race, even though entrants need similar skills. The degree of difficulty is of an entrant’s choosing. Young and not-so-young men and women continue joining the sport. First prize this year is a KTM 500 motorcycle, second is a KTM 300 EXC motorcycle, and the third prize winner will receive motorcycle gear worth $1500. Many other prizes will be awarded. Supporters love the action too. After gaining access to the forest from ACT Forests, the annual ride contributes money into the ACT economy while offering club members an industry-standard event on tracks equal to any others in Australia. Peter Daley says the annual ride builds relationships between the motorcycle industry, community groups and ACT Government. A strong bond has formed with the Vietnam Veterans Association over many years. The veterans feed riders and their supporters, and will be one of three caterers on the weekend. Up to 100 volunteers run the annual ride, including about 30 sweep riders who ride around the course at least 20 times a day to help any participant in need, or retrieve bikes. SES and St John’s Ambulance volunteers handle any emergency. The event is not open to spectators, only riders and their supporters. For more information, follow their Facebook page.